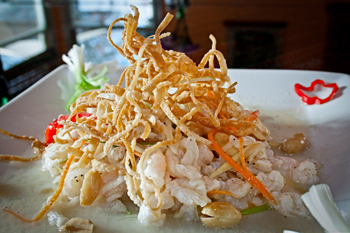 Ceviche with a Chinese influence, as served at El Tule in Lambertville, New Jersey. In the US, New Jersey is a significant population center for Peruvians. Sharing its menu with Mexican food, El Tule provides superior examples of traditional Peruvian dishes. Start with a (non-alcoholic) iced glass of Chicha Morada, traditionally made from purple maize blended with pineapple, quinces, cinnamon and cloves. Then, have a look at the menu, a mix of traditional Latino cuisine with (of all things) Chinese influences. Lomo Saltado is a good example of the cultural mix. Beef strips are marinated in soy sauce, vinegar, and spices, then stir-fried with tomatoes, yellow peppers, and red onions. It’s typically served with cut potatoes that resemble thick french fries, and with rice. Why the Chinese influence? Apparently, roughly 1 in 10 people living in Peru are Chinese or claim Chinese origin. The history dates back to the 1850s, when contract workers from Macau (in the day’s vernacular, “coolies”) who replaced the slaves on the sugar plantations and guano mines. As their contracts expired in the 1860s and 1870s, they brought family, married Peruvian women, and opened small businesses, including restaurants. In fact, the largest Chinatown in Latin America is located in Lima: El Barrio Chino de Lima. As with most Latin cuisines, the roots cross with other cultures (often, conquering cultures), but the deepest layers are native. In this vein, the ancient Carapulcra stew is based up0n a rich mix of pork, spice, a thick and richly flavored brown sauce, and potatoes. In fact, Peruvian vegetables are fascinating in their own right, a range of vegetables that has not yet reached public markets and popular tastes in the US: caigua, or stuffing cucumber, similar to a pumpkin; yuca, also known as cassava, which replaces the potato (and must be carefully prepared to remove the toxic cyanide); and maiz morado, or purple corn. There’s an emphasis on root vegetables, and, in some cases, health benefits (explained on the linked page). Escabeche is a Spanish dish, imported by Peru and by a large number of other Spanish-conquered nations. Meat or fish is marinated in an acidic mixture, sometimes with vinegar, sometimes with a citrus juice. Ceviche is also common to many cultures, but Peruvians have evolved an impressive range of ceviche variations. Start with the basics: a white fish, lemon and/or lime juice (and there are all sorts of ongoing arguments about which lemon, which lime, because there are many varieties), salt, garlic, cilantro, and, often, some sort of fish concentrate. There’s a nice introduction to the Lima street version of ceviche here, and it includes some video. The roots of ceviche precede the Spanish conquest, and, according to this article, it was the Spaniards who added onions and lime. Ceviche is not easy to cook–the timing of the acid must be perfect, the balance of flavors is difficult to manage, especially in a busy restaurant kitchen. One key ingredient, distinctive to Peru, is a spice called huacatay. A relative of the marigold, it’s also known as Peruvian black mint. Another is the aji, or pepper, some quite hot. Sweet potatoes are also common: recently, I tried the Peruvian version of a tamale, with mashed corn replaced by sweet potato (and excellent idea). As I scanned a wide range of websites, many promised that Peruvian cooking would be the next big thing. Some were old, some were new. All made me hungry. 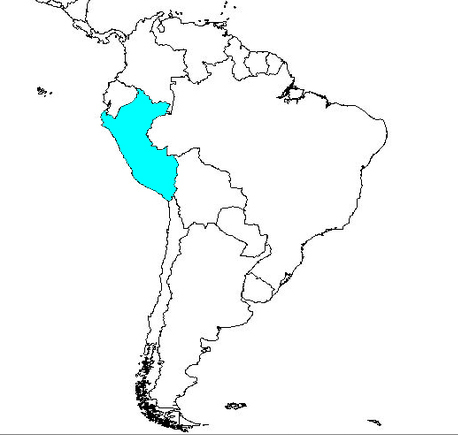 Just as a reminder, here’s Peru on the map of South America.